There’s not much in this world more refreshing than a tall, ice-cold glass of water. It is the best supplement and medicine for your body and nothing can replace the job that water does in your body. If you are not drinking enough water, be ready to face its consequences and our body has a natural alarm system to warn us when there is a lack of water and it is important to know these signs so that you will not continue leaving your body dehydrated. Water has many functions to do in our body like lubrication and moistening, detoxification, transportation of nutrients, keeping up cell functions, maintaining healthy internal organs, etc. While drinking water throughout the day is important, drinking it early in the morning when you wake up has something special. I don’t think there’s anyone alive that can deny that sometimes, a simple glass of water can be more satisfying than a cup of coffee or a can of soda and Go through the symptoms and signs that are discussed below. This will help you to track the warning alarm about dehydration. 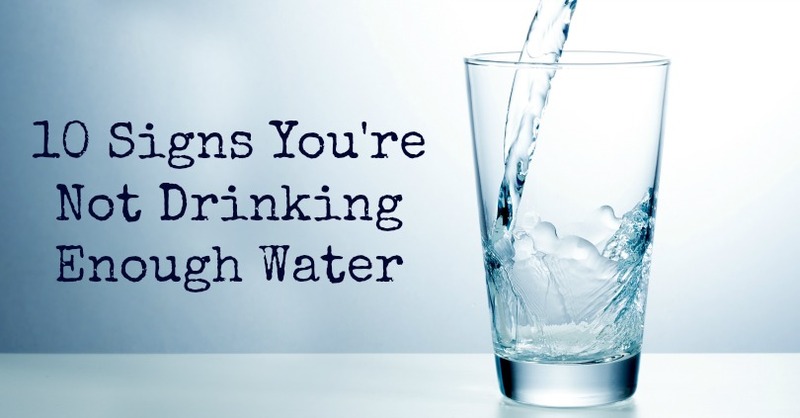 Here are 10 Signs You are not Drinking Enough Water. If you are not drinking enough water, the first and foremost sign that will remind you to grab a cup of water will be dry mouth and there will be a sticky feeling in your mouth and tongue. Drinking water can moisten and lubricate the mucous membrane of the mouth and throat to relieve you from the feeling of dehydration. Skin cells need to be hydrated to stay healthy. Dry skin is one of the major symptoms of dehydration and Dry skin problems will further move to scaling and wrinkling of skin. Constipation is one of the serious symptoms that you have to face if you are not drinking enough water. Water is essential for loosening the stool and to lubricate the digestive system and without water, the stool will become hard and result in constipation. Water is important for proper detoxification of the body. When you don’t drink enough water, the detoxification process will be in trouble. This will lead to skin irritations likepimples and acne problems. Avoid sugary drink and stick on to pure healthy water to drink. Don’t blame your shampoo or oil for frequent dandruff problem or hair problems. Check whether you are taking enough water. Dryness of the skin will cause shedding of dead cells. This applies to the scalp as well. Also Read : Why aloevera is best natural beauty product for your skin? Dehydration will affect all your cells. This will make you fatigued. Lack of water will cause a reduction in the water content of the blood. This will result in reduced oxygen supply to all organs. If you feel fatigued and lethargic, make sure that you drink enough water. If you want to know the most common sign of water scarcity in your body, it will be nothing other than headaches. Lack of oxygen and increased blood pressure can cause constant headaches. It is also important to know the best water to drink for health. Avoid processed juices or cool drinks. Pure water is the best water for your body. Don’t forget to drink water; set an alarm reminder for drinking water or use a drink water tracker app now itself ! Do you have wrinkles on your skin that don’t suit your age? No doubt, this is one of the important signs that you are not taking enough water. The skin loses water content very fast compared to other organs. Dry skin and wrinkles are clear presentations of dehydration. Dehydration will affect your brain function also. There will be a reduction in the oxygen supply due to reduced blood volume. This will affect the brain cells and will result in impaired memory. Urine production is related directly to the amount of water that you take. Drinking water can dilute the urine. If water is lacking, the amount of urine will be less and it will have a dark yellow colour. If you experience urinary infection frequently, one of the major reasons is dehydration.